An international collaborative project was initiated to design and manufacture a mobility device for people with disabilities who have difficulties walking indoors and outdoors close to their home. The two primary participants were the International Centre for the Advancement of Community Based Rehabilitation (CIDA funded), Canada, and the National Institute of Design, Ahmedabad, India. 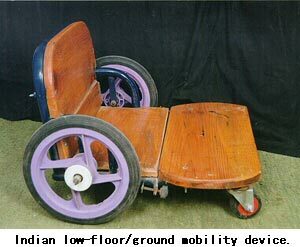 Why a ground mobility device? Carry items (e.g., a water bucket, children). Who can use this device? Where to use this device? In the home, school, or at work. Climb on/off (put lock on first). This is a simple design which can be easily changed to fit the person better. Locally available materials should be used whenever possible. The costs depend upon local circumstances, material and labour costs and number of devices produced. B: Back cushion, extra back or side support. F: Larger or smaller seating area (not shown). Design with jute or plastic weaving and one castor wheel.